I have been using my Flatmaster drum sander (http://stockroomsupply.ca/shop/drum-sanders/18-flatmaster.html) for 2 years now and thought that I had something yet to add to the previous reviews for this product. I purchased my Flatmaster complete with the metal top sans the motor; married it with a NIB – OS Dayton motor. Assembly and motor installation / setup was straight forward and easy enough. That said I had interference between the belt and my housing, the opening in the housing was not long enough and the belt would rub against it especially when under load. I remedied this by expanding the opening a 1/4” or so with a file and emery paper. The table top is flat and sturdy, the edges were sharper than I was comfortable with so I relieved the edges of the outer perimeter and drum opening with a file and abrasive paper so that it would be less likely to catch or mark wood when passed over it. Periodically I apply multiple coats of a high grade carnauba wax (Collinite No. 845 Insulator Wax – fantastic wax BTW) which protects the metal and facilitates smooth feeding of material over the top. The unit has effective adjustments while the fit and finish of parts are good. I routinely use grits ranging from 60,80,100,120,150,220. The paper supplied with the unit is Klingspor stearated paper, I have since purchased paper directly from Klingspor via their online retail store – http://www.woodworkingshop.com. I am very satisfied with the performance of this paper, the grit has good longevity, uniform aggregate sizing and distribution allowing for an even scratch pattern. If reasonable care is taken the backing (hook & loop) holds up well to repeated removal and re-installations. To ensure optimum performance and longevity care needs to be taken when installing the paper onto the drum. Starting the roll on the drum requires that you get the angle just right as it sets the stage for the entire wind. Paper needs to be aligned in such a way that with each revolution you get a narrow space between each wind of the paper, do not allow contact or overlap of paper. I save a used piece of paper which fits well as a template for each new installation – doing so ensures that I will get both the length and cut angles on the ends correct, if the end cut is at the correct angle it is much easier to start the wind. I can make a grit change in less than 2 minutes. 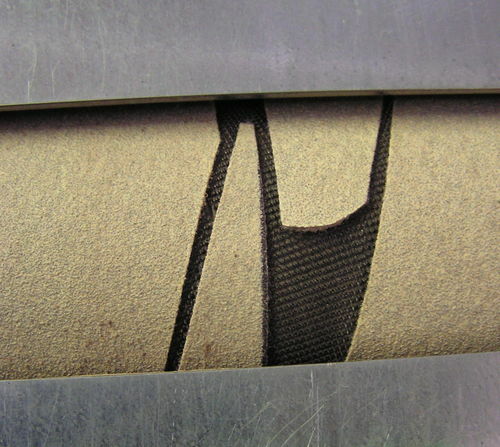 During application the paper needs to lie flat against the drum surface as it rolls onto the drum, if as you wind the paper onto the drum you find yourself making adjustments to the angle of the paper to maintain a uniform spacing between winds it can result in the paper being tight to the drum on one side of the pass and loose on the other. 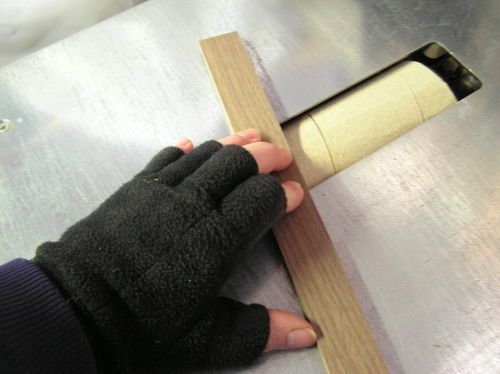 This can be detrimental because as the drum rotates the paper is pulled away from the drum by centripetal force (this is by design and is part of why the sander works so well as explained on Stockrooms website) the loose side could lift off the drum enough that it may grab the work piece at an edge, knot or rough area causing the paper to tear, the sander to jam and possibly causing damage to your work piece. Both ends of the paper have narrow tapers with points at the start and end of the wind. Application starts on the right hand side and wind over to the left end of the drum(facing the drum from the feed side of the table). During use the drum rotates toward the operator, if the paper pulls away from the drum on the right side as it rotates it is not an issue since it will be laid down against the drum as it rotates, much like a baseball card against a bicycle wheel spoke. The end of the wind (the left side of the drum) is an entirely different situation. If the paper lifts enough to engage with the top, or your work as it passes over the drum it will catch causing it to unwind in the blink of an eye. The first time this happens it is guaranteed to get your attention and you will have destroyed a good deal of paper. I have found that trimming the taper on the left side of the drum to a much blunter point and pressing the tip down into the drum hook material prior to operation will all but eliminate delamination. I have a magnet that I place inboard from the end of the drum on the surface of the table which acts as a limit preventing me from passing material over the end of the wind. Let me just say this before I go any further, I love my Flatmaster and I can’t think of doing work w/o it. That said, it has a very definite learning curve if you are going to reap all the benefits this machine has to offer. • The Flatmaster differs from a belt sander or thickness sander in that material is being removed across a single concentrated line, at the tangent where the drum contacts the work piece. The feed rate can vary a great deal as it is controlled by the operator. What this means is that the quantity of material removed will vary with the feed rate, slower rate / more removal. If you pause for just a fraction of a second during the feed you will wind up with a sander induced snipe mark, the longer the pause the deeper the snipe. You can easily run into this when feeding longer boards through. Feeding long boards requires that you change either your grip or the hand that is doing the “pushing” as the board feeds through. 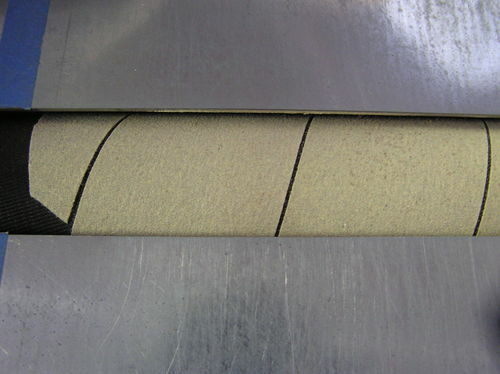 This very similar to when you create saw marks or burns in the kerf on a board while hesitating the feed through a blade on a TS only in this case it is a much more sensitive operation. If you get or suspect a snipe mark, subsequent passes will do little to nothing in the way of removing it – in fact it can amplify it as the drum will drop into the dip and make it larger. I have found that feeding the board askew to the drum (canted to one side or another) for a few passes alternating the skew from side to side will get rid of all but the worst snipe marks. Just as you will have little luck driving a vehicle over a sharp drainage ditch with an angle of attack which is perpendicular to the ditch – you will have more success with an angle of attack that is less than 90 degrees to the ditch. • Uniformity in feed rate is essential for an even surface treatment and to maintain parallelism between opposite surfaces. This cannot be over stated. Feed a board faster at the start and slower toward the end and you will remove more material from one end than the other. You will not see much of a difference with one or two passes but over multiple passes it will add up. To minimize this I alternate which end is the lead every couple of passes. • That the board be kept parallel to the table top throughout the entire pass, i.e. equal pressure on the table top in front of and behind the drum. • Even downward pressure needs to be applied at the point where the drum makes contact with the work piece. The weight of the board is usually enough to be effective. With thin pieces I keep my hand on the piece over the drum. I use my thumb as fence guiding the feed and apply downward force with my fingertips as the piece feeds through. • The feed rate for each pass needs to be as uniform as possible from start to the end. She makes a lot of dust so wear a respirator or have dust collection attached. The machine gives the operator good feedback, both tactile and auditory as you can “feel” the drum working and hear the rpm change as you encounter various types of grain or when you move between full and partial contact as when flattening a board. There is no substitute for experience, as I have said, you will get the best performance from this tool as you log time on the machine and develop techniques which work best for you. More often than not I have my Flatmaster setup to run two grits simultaneously, with a different grit applied to each half of the drum. 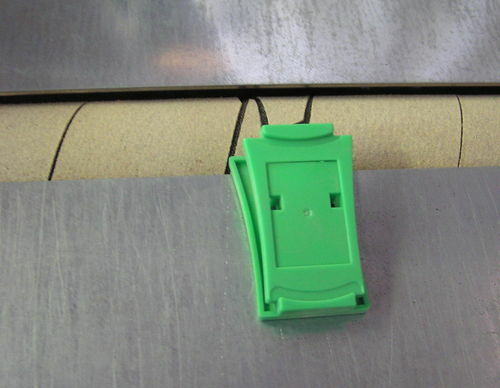 This saves setup time however attention needs to be paid so that you do not feed material over the center of the drum where the wind for the grit loaded on the right side of the drum terminates – I install a magnetic block in this area as a reminder to avoid the section so as to avoid the scenario outlined in the section above. I also have a piece of painters tape applied to the table top with each grit written on it, I place a magnet over the grits loaded on the machine so that I can tell at a glance what is on the drum. • Sanding boards or work pieces which are less than 4’ and longer than 4” in length. • It outperforms an open belt sander (stationary or handheld) for most smoothing tasks. • The Flatmaster excels at flushing splines, box joints, and dovetails. • Will flatten boards, removing or reducing cups, twists and dips. • Use with long boards – in excess of 4’. • Is not a substitute for a stationary belt sander. Than k s for a very good review and comments on the use and how to use it. I have the 24 inch FlatMaster and I agree with everything you said. Very good review of a very good product. As you say it has it uses and it’s not for everything but for what it is designed to do, it works well. Anyone had a chance to compare this to a Sand-flee? We’ve got one in the shop which is handy. I was just curious how it compares to the competition. I am only vaguely familiar with the Sand Flee but it looks like a very nice unit. I really like the idea of a PTO, it also looks to be more compact also the dust collection system looks better. The drum looks to have a larger diameter on my unit which I would prefer – more paper equals longer intervals between paper changes. I did a search and It looks like the Flee may be out of production which is too bad as competition is always better for the consumer. In the Flee videos I just watched they mention taping the ends of the paper down so that they do not catch on your work, how do you do this; what type of tape do you use? Wouldn’t the tape wear out /off? I haven’t had to change the paper yet since we bought the machine. It came used and the prior owner used narrow, fiberglass-reinforced packing tape to fasten the ends. So far we haven’t had an issue with it coming off. The only minor complaint is that the table height adjustment is difficult to dial in perfectly. That makes sanding wide boards a pain as they tend to sand unevenly. We mostly run narrow stuff on it anyway. Do you have any experience using the Flatmaster with high grits of sandpaper (220 or above)? I’m wondering if the unique design of this machine would eliminate the pitfalls commonly associated with fine sanding with drum sanders (e.g., burning of wood, easy to bog down motor, etc.). Ideally I’d like to keep higher grits on a flatmaster and eliminate the need to use a handheld electronic sander so much for final sanding. Not sure if it leaves valleys / channels in the wood like regular drum sanders do.